Sydney-girl Lauren King is working on board a search and rescue ship in the Mediterranean Sea coordinating communications for Médecins Sans Frontières. She shares her experiences working on one of the most dangerous migrant routes into Europe. What’s the daily routine of a communications manager on board a search and rescue ship? I coordinate all communications for Médecins Sans Frontières from the Aquarius – the search and rescue ship chartered by SOS Méditerranée, in partnership with Médecins Sans Frontières. The first thing I would do each morning is check my phone for any media requests. Working in communications means you are always on call! There are often independent journalists on board the ship, so I set up interviews for them and organise the logistics of their visit. Then I scan the daily media, respond to interview requests, write stories, and make videos for social media. But of course, when there are rescues, all plans go out the window! Quite often we’re woken up at 4am by the Maritime Rescue Coordination Centre (MRCC) informing us of boats in distress. I grab my tools – for doctors, it’s the medical kits, for communications, it’s your phone and camera. I wake up the journalists on board, and then I head up to the deck to take photos of the team in action and update twitter. After that, I help with the rescue. I hand out rescue kits and assist the midwife in the women’s shelter. My scheduled deck watch is a great time to hear the stories of the people we have rescued. 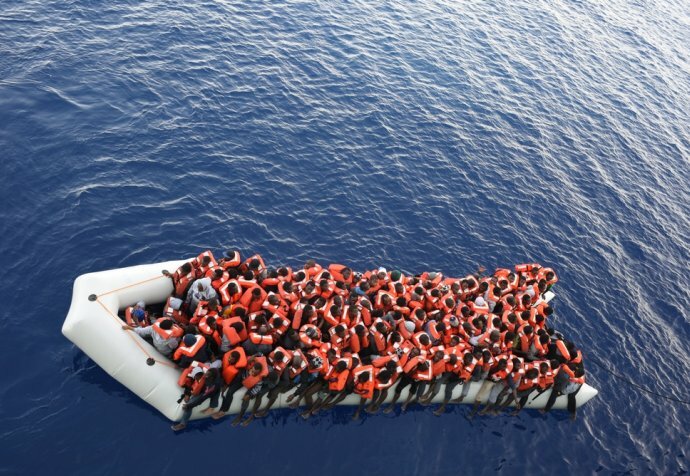 In between rescues, all on board the Aquarius participate in training drills. The hardest time on board is disembarkation. Watching people leave after two days hearing of their extraordinary journeys from Africa and the Middle East, and not knowing what their future holds, is incredibly difficult to do. Once they disembark we can’t do much for them. It’s especially difficult with the unaccompanied minors; the teenage boys who had made this dangerous journey alone from their home countries all the way into Libya and onto the rubber boats. They are full of so much hope and potential, and we can’t comfort them with what is to come. The team would identify the most vulnerable cases and link them to other organisations in Italy, such as IOM or Save the Children. Apart from this, we can only provide humanity and dignity in the short time we are with them. Being on board the Aquarius is the most rewarding job I’ve ever done, not only from a communications perspective, but also from a humanitarian one. I directly contribute to the rescue of thousands of people and hope to show them some kindness in the process.